BECKHOFF Automation extends its I/O systems range for ‘hygienic design’ applications with the introduction of the EQ series EtherCAT Box I/O modules in V2A stainless steel housings. The new Beckhoff EtherCAT Box series of stainless steel I/O modules meets the requirements of protection class IP 69K and is designed for direct use on machines in application areas with high hygienic standards such as the food, packaging, chemical and pharmaceutical industries. The rugged and robust I/O modules are available in a wide range of digital and analogue units to cover the typical I/O requirements. 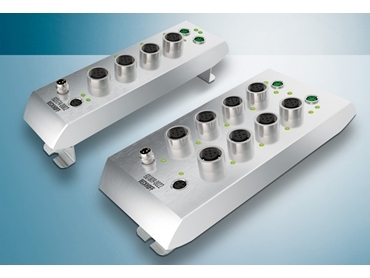 Beckhoff’s new EQ series EtherCAT Box modules with IP 69K protection and stainless steel finish allow processes and signals in hygienically critical areas to be measured, evaluated and controlled directly on the machine with the high performance of EtherCAT. The EQ series EtherCAT Box meets all ‘hygienic design’ requirements and thrives outside of electrical cabinets. Key hygienic design features include stainless steel housing and screw connections, screws fitted flush without grime-collecting contours, and distributed I/O boxes mounted to the machine or plant by means of mounting brackets to avoid unwanted cavities and joints that can attract dirt. The EtherCAT Box modules from the EQxxxx series cover an extensive range of I/O signal requirements. The signals are connected via rugged M12 connectors. Beckhoff’s broad range of ‘Hygienic Design’ stainless steel devices also includes stainless steel control panels and panel PCs with gap-free and flush fitting housing design along with the new Beckhoff AM8800 servomotors in a stainless steel version.